In case you didn&apos;t catch a look at Arena das Dunas, which FIFA officials inaugurated and unveiled to the world earlier this year, we have all the details on the recently completed FIFA World Cup 2014 stadium. The stadium, designed by leading architecture firm Populous, is simply massive, as expected. The sports venue, located in Rio Grande do Norto, Brazil, consists of 42,000 seats and twenty petal-shaped modules that encase the exterior. Each petal has been decked out in aluminum tiles and rearranged asymmetrically around the structure to resemble the sand dunes that surround the city. In between each petal are translucent pieces of polycarbonate, which will allow for plenty of natural light. Arena das Dunas is one of four brand new stadiums designed for the upcoming World Cup. Two others have been entirely rebuilt, and six others are being renovated. 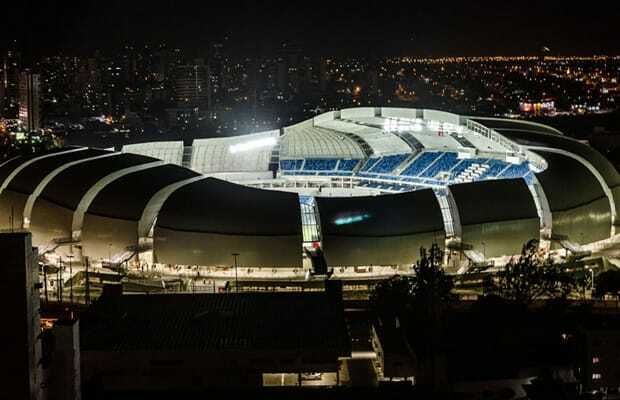 Though many soccer enthusiasts will certainly be watching the matches that take place inside Arena das Dunas, sadly not all will be able to enjoy it first hand. Oh, well. Guess you&apos;ll just have to live vicariously through the spectators sitting in the front row, just fifteen feet away from the action.